The European Commission’s chief Brexit negotiator said yesterday that no “decisive progress” had been achieved in the third round of Brexit negotiations in Brussels. 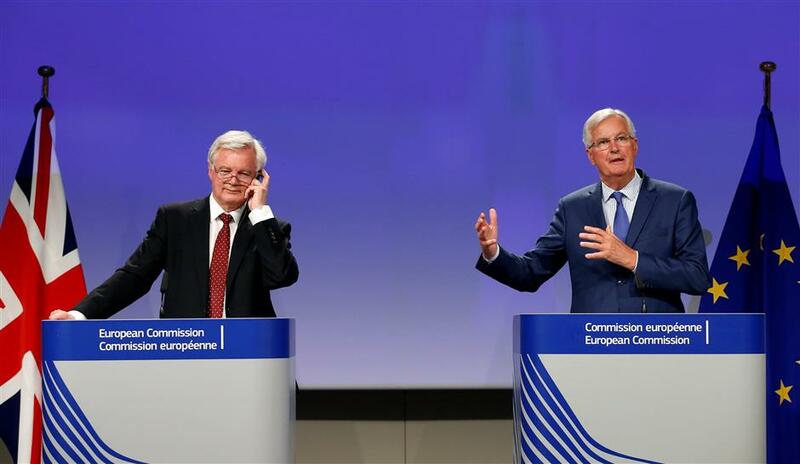 Britain's Secretary of State for Exiting the European Union David Davis and European Union's chief Brexit negotiator Michel Barnier hold a joint news conference marking the end of the third formal negotiation session in Brussels, Belgium August 31, 2017. The European Commission’s chief Brexit negotiator said yesterday that no “decisive progress” had been achieved in the third round of Brexit negotiations in Brussels, and that opening talks on the two sides’ future relationship in October was unlikely. “Over the course of this week we have made a number of useful clarification on a number of points, for instance the status of border workers,” Michel Barnier told a joint news conference with Britain’s Brexit minister David Davis. Barnier scolded London for demanding the “impossible” — including having a say on the European Union’s single market rules while being outside of it — in a series of position papers the British government released last week. He said both sides disagreed again yesterday on the EU’s demand, firmly rejected by Britain, that the European Court of Justice must be allowed to police the enforcement of rights of EU citizens residing in Britain after Brexit, and vice versa. “In July, the United Kingdom recognized that it has (financial) obligations beyond the Brexit date,” Barnier said. “But this week the UK explained that its obligations will be limited to their last payment to the EU budget before their departure,” he added. Barnier made clear the EU’s and Britain’s positions on Brexit remained so far apart there was little chance the EU would agree to start talks about its future relationship with London as had originally been expected in October. “We are quite far from being able to say that sufficient progress has taken place, sufficient for me to be able to recommend to the European Council that it engage in discussions on the future relationship between the UK and EU,” Barnier said.